Professor C. S. Lewis indicated we no longer burn witches because we no longer believe they can harm us. The corollary must be that we believe wholeheartedly in science because we have seen how much it can benefit us. The benefits of science are obvious, though as a Christian Humanist, I might point out that there remain questions science cannot answer. Just as the scientists developing the atom bomb were not the ones to decide to use it, so many of the most important questions in our lives cannot be answered by induction alone. Many things that require faith, which is why science will never be the only way we know things. 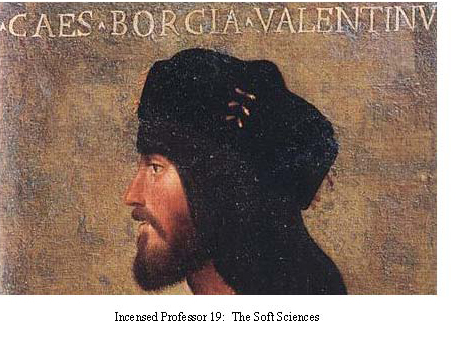 The social sciences are sometimes called the “soft sciences”; in their essence, they are not sciences at all. They make use of science in an ancillary role, say carbon dating, which is useful to historians. (Even that is not always dispositive; the carbon dating of the Shroud of Turin that seemed to disprove the theory that it was Our Lord’s burial cloth has since been reexamined, and there is a credible theory that the original sample was corrupted by medieval repairs.) I was trained as an historian, and I can tell you that, while historians use science, the discipline itself is one of the Humanities. We can use sciences to bolster our interpretations, but our conclusions are not scientific, D. G.! We can use science to date the documents we use, but we cannot use science to interpret those documents. My point is not that Professor Mattingly is right, though he well may be (albeit even Cesare has defenders), but any interpretation of Machiavelli’s Prince a political scientist makes is necessarily more “literary” or “historical” than it is “scientific.” This alone is enough to remove the “scientist” from the political scientist’s title. This is not only true of history and political science; it applies across the board to all the social sciences, even those using “scientific” experiments. When any experiment is used to bolster an interpretation that cannot be purely inductive, we have something more akin to the Humanities than the sciences. Now I happen to think the Humanities, the studies that tell us who we are, are at least as important as science. Scientists can invent the atom bomb, as I mentioned, but they are loath to take responsibility for its use. That is the province of moral philosophy, if not theology. This I still find the Liberal Arts essential and more “important” than the sciences. Psychology, perhaps the most “scientifically” trammeled of all the social sciences, with experiments and data galore, seems more a sub-branch of philosophy than anything else. Philosophy does not begin with induction; it begins, like any religion, with “credo.” A psychologist either pledges an unproven allegiance to a particular psychological school (Freud, Jung, Adler, Rogers, &c.), or makes up his own system from multiple schools. Science starts with hard evidence and experimentation; it induces its findings. Psychology, like most of the more important things in life, depends on deduction as much as anything else. You cannot “prove” psychological theories; you “believe” in them. Now I think that almost all of the most important things in life are not “provable”; they depend on faith, not proof. As George Peele put it, “Duty, faith, love are roots and ever green.” “Duty, faith, love are roots and ever green.” These are not things that lend themselves to science; they are deduced from things we “know”. How can we prove our spouses love us? We have evidence from their actions, but as the divorce rate clearly shows, that evidence does not always “prove” much more than our own ability to misread it. All the social sciences are valuable, but they claim to be “scientific” to borrow the authority of science. If we remember that, without the liberal arts, science is mere mechanics, we can restore the social sciences and the Humanities to a place even the sciences might envy.